Most of the real work is done, and now it's time to play. For instance, I have plenty of elderberry tincture put up, and a few pounds dried, so now I get to play with things like jelly and CANDY! We made some hard candy the other day, and it turned out pretty well - if I do say so myself :-). I just used the typical horehound candy recipe, substituting concentrated elderberry juice (and some lemon and ginger) for the horehound tea. Yesterday I tried some other herbs in the recipe. Not *quite* as many as ricola, but close. That one is a little soft and more like a hard taffy. Dangerous to fillings, but oh-so-good! Of course I will continue to cut and dry the various mints and berries, the holy basil and the passionflower - but other than some burdock, echinacea, and dandelion roots - the big stuff is already tinctured or made into teas. 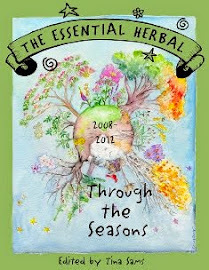 Blue Vervain, Boneset, Chamomile, Chickweed, Echinacea, Elderberry, Holy Basil, Lemon Balm, Mimosa, Motherwort, Oat Seed, Passionflower, St John's Wort, Stinging Nettles, Vitex, and Holy Basil/Albizzia BLEND. For this week - through Saturday, Sept. 5 - orders placed that are over $30 will get an ounce of elderberry candy thrown in for free! I will probably go looking for some goldenrod soon, but am thinking about making that into a candy - stay tuned for info on that - lol. In just 2 short weeks we'll be working on another issue. 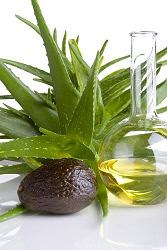 It will bw the November/December issue, and we have a group article that addresses favorite remedies for colds and flus. If you are a blog reader and you'd like to contribute to the printed magazine, you can answer this question with your favorite remedy, the recipe for it, and your name and website. 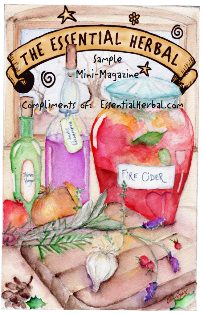 Otherwise, it is a great issue to consider advertising your herbal wares! Off to go play in the soap studio today with Maryanne. Seems like forever... but that's only because the shelves are getting so bare! 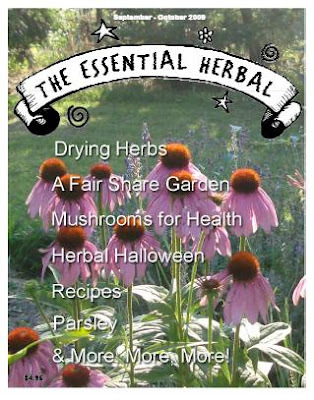 We've got another incredible day of herbal goodness planned on September 13th. We will begin with a short weed walk and discuss different methods of preserving herbs over tea and a snack. After discussing various herbs that are traditionally used for unwinding and relaxation, we will be blending a relaxing tea. Each participant will make their own blend and take it along. Next, the bounty of elderberries in the backyard beckons, and we'll be making elderberry syrup to help ward off colds and flu this coming winter. We will also mix up eye pillows, and a lotion, the details of which we will probably come up with during the class - depending on what you all want to make. We'll end the day with an herbal supper. Supper will come from the garden, and will most certainly include the scrumptious tomatoes and basil that are growing so well there. Maybe some wild roots? We'll see :-). Participants will leave with some of the tea blend, the syrup, an eye pillow, and a bottle of lotion, as well as a booklet that will include instructions and recipes from everything we've done that day. 11:30 to 6:30. The whole day is only $75! Come sign up today - space is limited. It is hard to believe that it was exactly a week ago that we were tossing our sleeping bags into the car and heading west to Somerset county. We were vending and speaking at a day devoted to wild native plants, and it was something we've been looking forward to for a very long time! We arrived in the early afternoon and had several hours before we were to meet several other attendees at a local restaurant. We were also expecting 4 other women, with whom we'd be sharing a bunkhouse. We decided to wander down the road a bit. It was amazing to see how many plants are common that we don't even see here - just 150 miles away. Additionally, some of the plants we DO have behave differently. It was fascinating. For instance, although our woodland hillside here is covered with Mayapple in the spring, I've never actually seen a fruit. Perhaps the deer eat them? We did see several deer during our stay in Somerset, but I can't imagine why we don't see the fruit here. I may actually go out hunting them in a day or so if the heat ever breaks here. They are delicious! One of the first plants I saw along the road way was this one, below. It looks like a cross between oregano (leaves) and wild bergamot... sort of? Does anyone know what this one is? It had a faint scent that could back up either one of those guesses. Fred showed us the next one, calling it Water Horehound. It was another one with very little fragrance. He also pointed out the trillium berries, saying that in all of his years he's never seen them before. We don't have a lot of trillium on the property here, other than what I've been bringing in for the past 5 years. It would be interesting to go over to the wildflower preserve and see what's shakin'. This lake was right across from our campground, through a small swamp and some trees. We later realized that about 1/4 mile up the road there was a paved drive with a sandy beachy area. ha. I just adored this perky little posy with the deep pink buds opening to white flowers. No idea what it is, but as you'll see there are several of those. On the weed walk, Fred had identified and had information on well over 100 plants. No matter how many you know or how long you study there will always be new (to you) species waving hello. That's what makes it so exciting. This magnificent fungus was about 20 feet up a tree. The trees were another source of amazement, as Fred pointed out 2 bee trees, where you could see the bees coming and going from their natural hives inside the trees. They were too distant for me to capture with the camera, though. This candelabra tree had Maryanne (in orange) talking about the trees that were trained in that manner on the grounds of Mount Hope Estate. It made us wonder if at one time someone had attempted to sculpt this tree or if it was a natural occurance. Another one that none of us could identify. There's something familiar about the leaves and the way they are situated on the stem, but I can't place it. Joe Pye-ish? Finally at home the other day I spied this spiderweb in the early morning fog. They seem to be one of the clearest signs of the impending autumn to me. Soon they will cover the shrubs in the front of the house with shrouds that look like Halloween decorations. OH! I saw a baby fig on the tree the other day - I will have to watch that grow... and I just realized that this was Friday and there are no faves posted here. Perhaps there will be more later. Another stunningly stuffed issue is winging its way to the homes of subscribers. It is so much fun coming up with the cover now that we're using color! In fact, it's hard to decide which picture to use. Anyhow, we've got a great harvest issue. Field Notes - how this summer went in the garden. 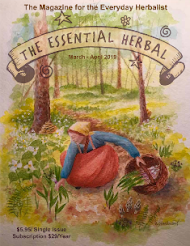 Looking through the magazine, I find that almost all of the articles include some recipes, ideas and instruction for the use of the herbs being discussed. 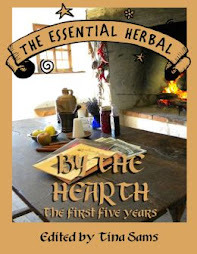 4 herb and bread recipes, tabouli, mushroom tincture, chaga chai, mushroom soup, apple crisp, pumpkin ring cake, sauerkraut and pork chops, Brethren cheese bread, 5 tea blends, and lots more. There's enough to keep an herbie busy through the fall. Earlier today, my sister and I were on a fairly unpleasant errand, but even so the meadows were delicious. This year in particular the weather has conspired to create such an array of colors and delights, medicines for the spirit as well as the body. As we drove along, I said that they make me want to walk across the country, taking the time to look at all of the wonders that Nature has strewn before us. Of course in this scenario, I'm younger, fitter, and have no responsibilities, but it's a dream so let's not pay that no nevermind. I thought it would be fun to share some of the visions that crossed my path today on this, a most ordinary of days.... The day started early, with me trudging down to the pond through the heavily dewed grasses to gather the wild beebalm. It was the nick of time, as most of it had already flowered and was past its prime. There was enough for perhaps a pint of tincture. The flowers and leaves sat in a basket in the car all day, and were perfectly dried when I got home with the alcohol (they must think I'm an awful lush at the liquor store). Note the tiny blue dayflower in the picture along the left edge. On a milkweed plant across the path from the pond, I spied a group of caterpillars munching away, preparing to become butterflies. They were awfully busy, and didn't even notice me. Further along, I came to the Boneset patch. It is smaller than I'd hoped this year, so I left it alone. There should be plenty in Somerset this weekend, and it probably won't be in full bloom yet. Our day took us to the hospital in Hershey. Right outside in the strip between parking lots this group of mushrooms were growing beautifully, unaware of being in a well traveled area. On the way home, we came upon an area that is actually (as it turns out) the entrance to a State Game Area. In this picture, there is the purple Loosestrife right next to some ripe elderberries, and they both rest their feet in a tiny little creek that is full of blooming jewelweed. A butterfly drinks from the top of some Joe Pye blossoms. Truly the Queen of the Meadow! I would say that this little sorrel is just completely confused by being right next to the road where heaven-only-knows what kind of stuff it gets sprayed with. It is about 5" across and looked for all the world like a hydrangea! Today's spectacular find!!! Blue Vervain. This has been a mystery to me for several year - but not enough for me to actually go out and look at it. This is a time of year that apparently hasn't ever been right for wandering, I guess, and this year is just perfect weatherwise and curiositywise. We used to carry it in our shop for magical purposes, but I wasn't aware of any great medicinal value. 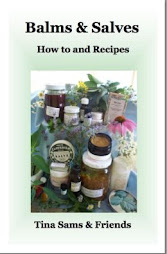 This evening Susan Hess told me about using the tincture for shoulder and neck issues. Gorgeous stuff. So pretty it can almost make you cry. Finally home again I wandered the yard briefly. The mallows are blooming, and there is something about the buds, so full of promise that is just exquisitely beautiful. So that was my day. I hope yours was lovely too! Each Friday, I hope to spotlight a couple of our advertisers and a couple other cool things I've come across. Since my last entry showed my fascination with the bees in the yard (after last evening, I am fervently hoping it doesn't turn into a snake thing), we are continuing with that - the buzz of bees! First is The Original Soap Dish. The Bailey family succeeds in bringing their customers some of the finest ingredients available for soap and lotion making. Beeswax pastilles (SO nice to work with!) and honey powder are there, as well as sometimes hard-to-find Lye, colors, fragrances, packaging, extracts, things like strawberry pulp powder, and additives to add volume, shine, glide and shimmer. Here in Lancaster, we have Dutch Gold Honey. 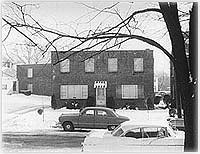 For a long time, the plant was run on a residential street by the Gamber family. It wasn't even noticeable, and I know that because I lived a block down the street for years. The honey house was built on a vacant lot across from their home in the 50's. It is now a home, surrounded by other houses. The honey bear bottle that we've all come to recognize was Ralph Gamber's "baby", and Dutch Gold used it long before it became part of the PBJ of our collective childhoods. They have grown to now be using a very large warehouse, and they supply several interesting honeys in their shop - blueberry, eucalptus, tupelo, wildflower, orange blossom, and buckwheat come to mind. They have a page with honey recipes. At Herbs from the Labyrinth, Sarah gives the bees plenty of pollen and nectar from the labyrinth garden she's been tending for several years in her backyard. Many of her fine balms and salves contain beeswax, and she uses local products whenever possible. Stop by her website to see pictures of the labyrinth and visit her shopping cart -OR- if you are in Lancaster for vacation (or if you live in the area) she has a delicious shop called Radiance at 9 W. Grant St., Lancaster PA. Sometimes you will even find me behind the counter. I like to put in a day here and there. She lets me play in the vast apothecary :-). Haagen-Daz ice cream has a website devoted to honey bees and their struggle against colony collapse, called Help the Honey Bees. There are ideas of ways that we can all help, and lots of information. And, last but not least, I caught a few minutes of The Today Show this morning, and the author of this article was shown in a segment about the value of farmers markets. 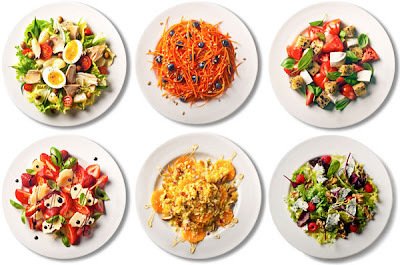 Check out these scrumptious recipes!!! Some of these pictures will be fuzzy. Some of them were snapped as I dipped and dove, trying not to alarm any of the creatures dining on the vitex and mountain mint in the yard. It astounds me looking at the shots, that there aren't more of them in there. The bushes are humming, buzzing, and appear to actually be moving. It is a humbling experience to stand near one of the bushes. I'm not going to even pretend to know what varieties of bees these are, but do find it incredible that they are so happy to dine together. There was no bullying that I could see. No crowding, pushing, or butting in line. Just everyone working away, gathering nectar and pollen. I have taken off my glasses to type this. My vision is pretty bad. Still, looking out at the vitex I can still see the bees and butterflies dancing around. Wow. I didn't begin to capture the variety of bees out there. There are multicolored wasps, lots and lots of honeybee's and all kinds of bumblies. I think my favorites are the big, slow bumble bees. They amble along like the Teddy Bear of bees. Some of them here have lots of yellow, and some are mostly black. They were most prevalent on the vitex, leaving the mountain mint for the many, many others. Do you even think this one is real? Look at the color on those wings. That's a fairy in disquise, I think. This banded one reminds me of a breed of cattle that we often see around here. There is another variety of bees - I think more waspy - with smaller bands, and about three on each bee. What can I say? Party time on the mountain mint! And finally, one brave little beauty stayed close to the ground, away from the bustle. That garden is one wild and crazy place. There were no yellow jackets and no hornets (at least what we called hornets when I was a kid). They are as lovely as the flowers. I started thinking about this entry last night, and then we had a little storm. Afterward, I went outside to find the bees. They were all hiding under leaves to stay dry. Some of them were bigger than the leaves. That was something I didn't know - where bees go when it rains.